959615 hits since In the fall of 2016 Rod joined Lillian in retirement. We acquired a 2016 Roadtrek Zion and have embarked on what we hope will be a long series of adventures. One of the few parts of this web site that is current and being regularly updated and enhanced are the Roadtreking pages. Please feel free to follow our adventures. 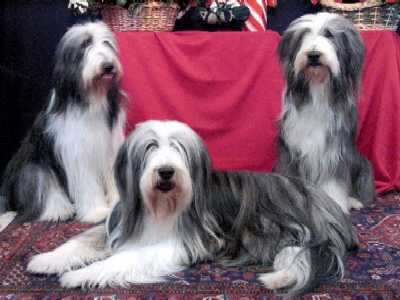 We have shared our lives with Bearded Collies (Beardies) for many years now. At present we are down to one 10 year old male Weston (CH Burlesque Knight at Strathearn) who is enjoying our retirement with us. The Beardies page is now pretty old but shows some of the delightful dogs we have enjoyed and some of the activities relating to the breed. You can amuse yourself watching and listening to a couple of our silly beardies sing along to some music. If you are using MS Internet Explorer it seems to work better if you download it first otherwise it seems to get truncated. Simply right-click on the picture and choose "Save Target As". 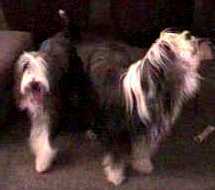 Netscape seems to work OK.
On March 4th, 2005 our Beardie girl Roxie gave birth to 8 beautiful puppies. 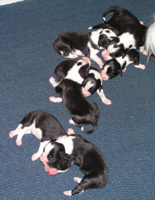 If you would like to learn more about them and follow their time with us, take a look at the Roxie-Logan Puppies page. There are lots of puppy pictures! You can also share a smile reading Inner Strength which was passed to me by a friend. Unfortunately the author is unknown.